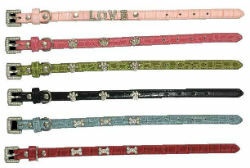 Faux Alligator skinned collars for the trendiest pets. Each Color comes with different sparkling gem trinkets. Bone Trinket comes in Blue and Red, Crown Trinket comes in Pink, Love Trinket comes in Pink, and the Paw Trinket comes in Black and Green. 1/2" width x 10", 12", and 14" lengths. 5/8" width x 14", 16" and 18" lengths. 1" width x 18", 20", 22", and 24" lengths. Options: Bone Blue 1/2" x 10" Bone Red 1/2" x 10" Bone Blue 1/2" x 12" Bone Red 1/2" x 12" Bone Red 1/2" x 14" Bone Blue 5/8" x 14" Bone Red 5/8" x 14" Bone Blue 5/8" x 16" Bone Red 5/8" x 16" Bone Red 5/8" x 18" Bone Blue 1" x 18" Bone Red 1" x 18" Bone Blue 1" x 20" Bone Red 1" x 20" Bone Blue 1" x 22" Bone Red 1" x 22" Bone Blue 1" x 24" Crown 1/2" x 10" Crown 1/2" x 12" Crown 1/2" x 14" Crown 5/8" x 14" Crown 5/8" x 16" Crown 5/8" x 18" Crown 1" x 18" Crown 1" x 20" Crown 1" x 22" Crown 1" x 24" Love 1/2" x 10" Love 1/2" x 12" Love 1/2" x 14" Love 5/8" x 14" Love 5/8" x 16" Love 5/8" x 18" Love 1" x 18" Love 1" x 20" Love 1" x 22" Love 1" x 24" Paw Black 1/2" x 10" Paw Green 1/2" x 10" Paw Black 1/2" x 12" Paw Green 1/2" x 12" Paw Green 1/2" x 14" Paw Black 5/8" x 14" Paw Green 5/8" x 14" Paw Black 5/8" x 16" Paw Green 5/8" x 16" Paw Black 5/8" x 18" Paw Green 5/8" x 18" Paw Black 1" x 18" Paw Green 1" x 18" Paw Black 1" x 20" Paw Green 1" x 20" Paw Black 1" x 22" Paw Green 1" x 22" Paw Black 1" x 24" Paw Green 1" x 24"